The PTFE Tapes are found suitable to seal pipe threads, wrapped around the exposed threads of a pipe before it is screwed into place. These types exhibit special high temperature properties like being of low co efficient of friction, chemical resistant, soft, ant sticky surface. 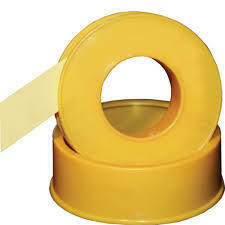 Being an industry leader, we offer comprehensive range of PTFE Adhesive Tapes that are resistant to corrosion and chemicals along with good tensile strength, ultimate elongation.